Born in India, Lalita Noronha has a Ph.D. in Microbiology and is a science teacher, writer, poet, and fiction editor for The Baltimore Review. Her literary prose and poetry has appeared in over sixty-five journals, magazines and anthologies. She has twice received the Maryland Literary Arts Award, an Individual Artist Award, and a National League of American Pen Women Award, among others. 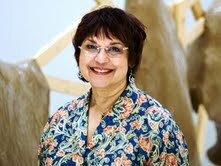 She is the author of a short story collection, “Where Monsoons Cry.” Her website is http://www.lalitanoronha.com. sorrow swallowed me like a python takes a rat, head first. watched his beady eyes, squashed head. he poured into the cage. as the fat rope uncurled, slithered, moved. a single hump below its head. held high to a beam of light. exploded from the belly of the earth, swallowed life whole. panga trees, whistling tuis, black swans. the fertile ground of forgiveness.